With various goings-on in our home, we've missed out on some of the festivals being held in downtown Edmonton. Taste of Edmonton, however, is one I didn't want to miss! My younger daughter isn't as interested this year, so it's just my older daughter, Nicole, and I this year. We usually split things between two days, focusing first on trying new stuff before we finish off our tickets on some tried and true favorites. The festival runs from 11am to 11pm. Usually we go during the day to beat the lunch rush, but with the heat, we tried going in the evening this time. Unfortunately, that meant my pictures sucked. I did manage to fix some to upload to my flickr account, but most weren't worth making the effort. We're planning to go back for 11am tomorrow. Hopefully, I'll get some better shots. You can see all the photos in the set I made for this year's festival. For now, I've just got the booths we bought from and the dishes we tried. 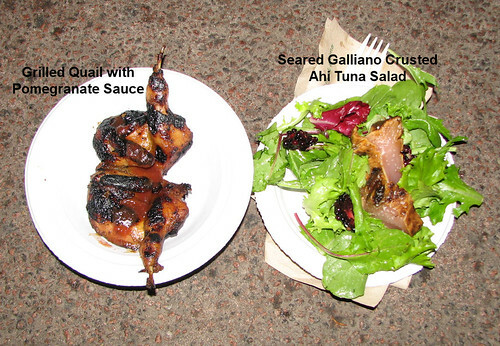 Here are our first dishes. First we checked out Lit - Italian Wine Bar for the Seared Galliano Crusted Ahi Tuna Salad, and Hoang Long Restaurant and Noodle House for Grilled Quail with Pomegranate Sauce. Nicole was really looking forward to trying the Ahi tuna salad, but I was much more trepidatious. I don't like tuna much, and have a real problem with raw or seared flesh. I like my protein cooked! No surprise that Nicole loved it, but I surprised myself in being able to eat the tuna without shuddering. That's a big accomplishment. *L* As for the rest, it was very tasty, and an interesting combination of flavours and textures. The touch of salt really made a big difference. We were both looking forward to the quail, which neither of us have had before. We both love pomegranate, so this should have been a shoe-in. Surprisingly, it wasn't. Nicole's verdict was "not bad." I found it good. We both found it difficult to eat. By the time I finished getting the meat off all those little bones, I felt like I hadn't actually eaten anything. It was tasty but... not as good as we'd hoped. On to the next two dishes. 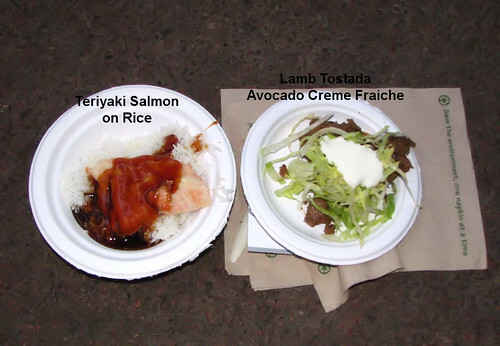 Here we have Teriyaki Salmon on Rice from Zen and Lamb Tostada with Avocado Creme Fraiche from Zinc. Zinc is a rather new restaurant we've been interested in trying out, so we were pretty happy to see them represented at the festival. I found it very tasty. It had more heat than I expected. I have a very low tolerance for spicy food, but this wasn't too much for me. The tostada on the bottom really added to it. Nicole, on the other hand, found it tasted like a burrito, which was a touch off-putting for her. She didn't find it bad, but it wasn't what she was expecting, and not as good as she'd hoped. As for the Teriyaki Salmon, we had an interesting diversion of opinions. I don't particularly like salmon. That part was all right, but for me, it was the sauce that made the dish. Nicole, on the other hand, loves salmon, but doesn't care for teriyaki. She found the sauce much too salty for her liking, but really enjoyed the salmon (she is indifferent to rice). There was only one small piece of salmon for us to split, which she found a bit disappointing. Next up, we went for something sweet. 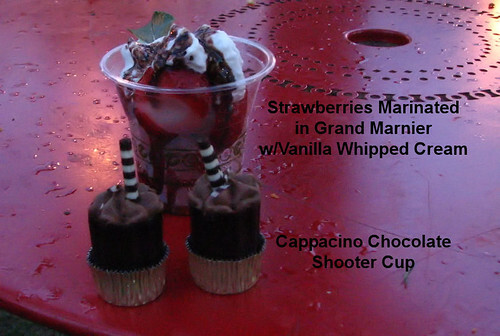 The shooter cups were easily the most adorable items being served! At only one ticket each ($1), they were also the best deal. They had a very intense chocolate flavour. In fact, chocolate was pretty much all we could taste. I happen to love chocolate, especially dark chocolate, but Nicole can take it or leave it. She didn't particularly like the texture of the dark chocolate cup, but it was nice. Neither of us could taste the cappacino. As for the strawberries, they were good. We both love strawberries, and we both like whipped cream. Neither of us could taste the Grand Marni er the strawberries were marinated in, so it basically just came across as ... well, strawberries and whipped cream. We quite enjoyed it, but nothing made it stand out for us. For our last dishes of the day, we mixed sweet and savory. 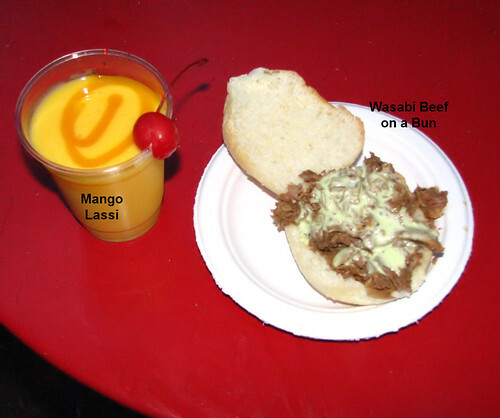 The Mango Lassi was from Khazana Authentic Tandoori Cuisine, while the wasabi beef on a bun was from Hawkeyes Too. We are not big mango fans, but Nicole wanted to try it out after seeing how good they looked on display. I chose the wasabi beef. I found the wasabi beef to be delicious and tender. The wasabi wasn't overpowering, but my inability to handle heat did me in. As much as I wanted to, I couldn't finish it off. Nicole enjoyed it as well - more than she expected. As for the mango lassi, she really enjoyed it and, surprisingly, I did as well. I found it quite sweet, but the smooth creaminess countered the spice from the wasabi very well. The mango flavour was quite intense. We both liked the texture of it. In the end, we enjoyed all the dishes, but still found it rather disappointing. It was all good, but nothing was really exceptional. We actually both settled on the Ahi tune salad as our favourite (even though I would have preferred it without the tuna, which my daughter finds quite amusing). What I found strange is that, even after having 8 different items between two of us, we didn't feel like we'd had much at all. Last year, with 3 of us sharing 9 items, we were usually very full by the time we had dessert. This time around, we found ourselves debating going someplace to sit down and eat. The quantities don't seem to have changed from last year, and we're splitting 2 ways instead of three, but it just didn't feel like we ate much at all. Very strange. All photos are copyright to Philippe or Anna. A word on our equipment. Anna: I am now using Philippe's old Nikon D70 and trying to figure out this whole DSLR thing. I think I'm getting the hang of it. Previously, I'd been using a Canon Powershot S3, which I really liked. I will probably still use it for its video capability and smaller size every now and then. I tend to either be "documenting" what we do as a family (then putting them together as DVD movies, which I make copies of to share with family) or playing with macro. I love macro. Mostly I use an 18-55, but sometimes I borrow Philippe's macro lens. That's one thing I prefer about the non-DSLR. No changing lenses.